When I reviewed Fantastic Beasts and Where To Find Them two years ago, I recall thinking that J.K. Rowling’s script was fine, but David Yates’ awkward direction hindered it from being a truly worthy follow-up to the Harry Potter series. Interestingly, the opposite can now be said about Fantastic Beasts: The Crimes of Grindelwald; Yates seems to have finally gotten the memo and actually brought a bit more life to this world of magic (though don’t get me wrong, his trademark awkwardness is still present at times), whereas it’s Rowling’s overstuffed and incoherent script that is the ultimate weak spot with this movie, once again hindering it from being as great as it could be, but also making it a slight disappointment for anyone looking for a worthy continuation of Rowling’s Wizarding World. 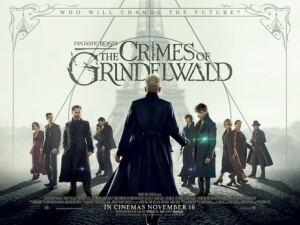 Taking place shortly after the events of the first film, incarcerated dark wizard Grindelwald (Johnny Depp) has escaped custody and is taking up residence in Paris as he begins to recruit new followers. It is now up to New Scamander (Eddie Redmayne) and his friends from the previous movie including Tina (Katherine Waterston), Queenie (Alison Sudol) and Muggle Jacob (Dan Fogler) – the latter of whom had his memories erased at the end of the last one, but has a pretty weak excuse as to how they’re suddenly back – to not only locate Grindelwald, under the orders of Scamander’s former teacher Professor Dumbledore (Jude Law), but also powerful young Credence (Ezra Miller) who is in Europe searching for his birth mother alongside a young woman named Nagini (Claudia Kim), who is being exploited as part of a circus freak show (which begs the question as to why a world of wizards, witches and all sorts of incredible creatures still needs a freak show, but that’s one of the many unanswered questions in this film). There’s also a couple of awkward run-ins with Scamander’s school friend Leta Lestrange (Zoë Kravitz), who’s now engaged to Newt’s older brother Theseus (Callum Turner), an encounter with immortal alchemist Nicolas Flamel (Brontis Jodorowsky), one or two obscure old faces coming back in some way (Kevin Guthrie’s Abernathy, a minor character from the previous film, is a bad guy now… just because), and enough plot filler to fill up an entire Order of the Phoenix-size book. That’s really what it all kind of feels like, a lengthy manuscript that Rowling conceived to fill in some of the historical gaps she left in the main Harry Potter storyline, which was somehow converted into a two-and-a-bit hour movie instead of actually being published. That would explain why so much of this movie feels long-winded and bogged down by needlessly complicated exposition as well as characters who have no real reason for even being there. The only reason I can think of as to why Tina, Queenie and Jacob are all back was because they were popular characters from the last movie (especially Fogler’s Jacob, who is once again one of the film’s few highlights), because other than that they serve very little purpose in the overall scheme of things, contributing nearly nothing except to provide a slight barrier to the main character, and to make decisions that seem very much out of left-field and only serve to set up more movies. There are so many other characters we are introduced to in this film that the movie barely finds anything for half of them to do – Claudia Kim’s Nagini, whose name will undoubtedly be very familiar to Potter fans, is just kind of there with nothing to do, in an underwhelming payoff after being built up so heavily in the trailers – that the movie quickly becomes a case of there being too many cooks in the kitchen, both on-screen and presumably behind-the-scenes with both Rowling and Warner Bros clearly having enough dollar signs in their eyes to worry too much about a straightforward plot and meaningful characters. The movie is kind of a mess, with so many plot points being focused on with way too many characters in the mix, and with no real pay-off to any of them in a rather anti-climactic ending that reveals that the film has no standalone qualities other than to tease further, and hopefully better, movies in this spin-off franchise. That being said, the movie is not without a few points of merit; like I mentioned earlier, Yates seems to have actually caught wind that his direction on the last film was pretty lifeless and lacking in any sort of real magic, and to his credit has actually been kind enough to inject some form of life into the proceedings here. In addition, though he is really not in the film that much, Law is a fine young Dumbledore, nailing the character’s warm manner with an added sense of vulnerability due to his past history with Depp’s Grindelwald; speaking of whom, Depp may have fallen from grace lately after a string of bad PR and a very off-putting private life, but while I cannot condone his actions in real-life I can still judge his performance here without letting all that come into play, and in that regard he is very much doing the same old weird Johnny Depp performance here, which at this point you kind of have to expect with this actor, regardless of who he may be in private. Would Colin Farrell have been better in the part, like he was for the majority of the last film? Sure, but even if he was, there are far more problems with Fantastic Beasts: The Crimes of Grindelwald than just Depp’s inclusion. That is a shame, because this is proving to be a very difficult series to like, when it really should be more straightforward than it is. Fantastic Beasts: The Crimes of Grindelwald suffers from a messy script that tries throwing in multiple characters and storylines but gives very few of them any real meat to chew on, making it an empty and unsatisfying teaser for future, and hopefully more focused, sequels.